Download a pdf of the paper in Forests. Proposals to remove the carbon dioxide caused by burning fossil fuel from the atmosphere include letting commercially managed forests grow longer between harvests or not cutting them at all. An article published in the journal Forests says, however, that Pacific Northwest trees grown and harvested sustainably, such as every 45 years, can both remove existing carbon dioxide from the air and help keep the gas from entering the atmosphere in the first place. Thats provided wood is used primarily for such things as building materials instead of cement and steel – which require more fossil fuels in their manufacture – and secondarily that wood wastes are used for biofuels to displace the use of fossil fuels. “When it comes to keeping carbon dioxide out of the atmosphere, it makes more sense to use trees to recycle as much carbon as we can and offset the burning of fossil fuel than it does to store carbon in standing forests and continuing burning fossil fuels,” said Bruce Lippke, University of Washington professor emeritus of forest resources. Lippke is one of eight co-authors of the article in Forests. It is the first to comprehensively calculate using woody biomass for bioenergy in addition to using wood for long-lived products. The article focuses on the extra carbon savings that can be squeezed from harvesting trees if wood not suitable for long-term building materials is used for bioenergy. Such wood can come from the branches and other debris left after harvesting, materials thinned from stands or from plantations of fast-growing trees like willow. For the article, the co-authors looked at selected bioenergy scenarios using wood from the U.S. Pacific Northwest, Southeast and Northeast. They considered two ways of producing ethanol from woody biomass – gasification and fermentation – and used whats called life cycle analysis to tally all the environmental effects of gathering, processing and using the resulting fuels. 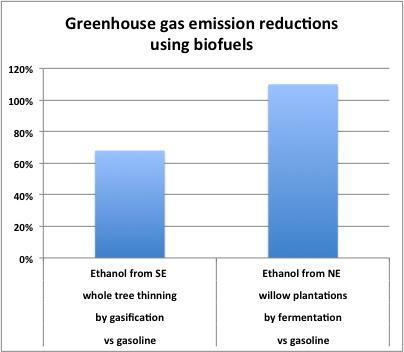 Ethanol from woody biomass emits less greenhouse gas than an equivalent amount of gasoline, between 70 percent and a little over 100 percent less. How much of a reduction depends on the process. Achieving slightly more than a 100 percent reduction in greenhouse gas emissions is possible, for example, using a fermentation process that both produces ethanol and generates enough electricity to offset the fossil fuel used in the fermentation process. While biofuels from woody biomass are carbon friendly, Lippke cautions that the U.S. should not use tax breaks or other incentives that inadvertently divert wood to bioenergy that is better used for long-lived building materials and furniture. Lippke said using wood for products and bioenergy can be considered carbon neutral because the carbon dioxide trees absorb while growing eventually goes back to the atmosphere when, for instance, wood rots after building demolition or cars burn ethanol made from woody debris. With sustainably managed forests, that carbon dioxide is then absorbed by the growing trees awaiting the next harvest. The co-authors arent advocating that all forests be harvested, just the ones designated to help counter carbon dioxide in the atmosphere. Older forests, for instance, provide ecological values even though they absorb less carbon dioxide as they age. In the article the authors also urge policymakers and citizens to consider not just carbon mitigation but also to find ways to weigh the importance of energy independence from fossil fuels when considering how to use woody biomass for bioenergy. “Simply burning woody biomass to generate heat or electricity makes sense for carbon mitigation”, he says, “But theres no energy independence gained,” Lippke said. So carbon efficiency is only one part of the equation. Transportation fuels depend heavily on imported oil and therefore biofuels that replace them make additional contributions to the domestic economy, including energy independence and rural economic development, the authors said. Other co-authors are Richard Gustafson and Elaine Oneil with the UW, Richard Venditti with North Carolina State University, Timothy Volk with the State University of New York, Leonard Johnson with the University of Idaho, Maureen Puettmann of WoodLife Environmental Consultants and Phillip Steele with Mississippi State University. The publication integrates findings across many previous reports generated by a consortium of 17 research institutions that have been involved in life cycle analysis of wood products for more than 15 years through the Consortium for Research on Renewable Industrial Materials, based at the UW. The recent biofuel life cycle research was funded with a grant from the U.S. Forest Services Forest Products Laboratory.